Now I do have a disclaimer – I like my pintos (and refried beans) best without any spice, but I seem to be in the vast minority, at least with people I’ve asked. And that’s why I developed this spicier version. If you’re a plain jane traditional pinto lover like me, leave out the spice and dice and saute an onion in the fat the recipe calls for before you add in your pintos and water. I would guess that most of us go the easy way out when it comes to Pinto Beans. We’re probably using them in Chili or maybe as part of a bowl and grab a can. I don’t even know that Pinto Beans, as a side, as opposed to Refried Beans (see my recipe on Doctoring up a Can of Refried Beans, Restaurant Style) or even Cowboy Beans (Frijoles Charros) are something that most of the US have really known that long or really appreciate. And I’m including all of the States, not just California and the Southwestern States. where I KNOW you know your pintos! I think Chipotle Mexican Grill is helping to change all of that with their trays of Pintos or Black Beans. And Chipotle Mexican Grill’s Pinto Beans are a little spicy and well flavored, so that might be why that spiciness seems to have become more prevalent in people’s expectations of Pintos. And while the canned pintos are pretty good and so handy, they really don’t stand up to the taste and beautiful texture of homemade Pintos. There is just a bit more firmness and a slight variation in texture throughout the homemade pintos that I find very appealing. One thing about homemade Pintos is that they should be “soupy.” Unless you’re serving a lot of people and using up your whole pot of beans, even if you’re straining the beans with a slotted spoon as you serve, don’t discard what seems to be an excess of sauce. It’s the perfect thing to use if you decide to refashion any leftover pintos into refritos (refried beans.) And the pintos usually “tighten up” a bit and thicken if stored overnight in the fridge so if you’ve strained off all the excess sauce, your pintos will be pretty thick. Whether I make my pintos on the stove or in the Instant Pot, I like to add a little bit of fat of some kind. A little oil works but why not add more flavor? If I have it, I’ll use a bit of bacon grease or lard. I don’t bother with the store bought packaged lard, I think it’s called Snowy? but lard either homemade or skimmed off the drippings of a roast or a lard from the butcher is a whole different thing. The fat of some sort is essential in the Instant Pot because it helps keep the sputtering down and lessens the possibility that the vents might become clogged. The fat, in either the Instant Pot or Stovetop version, makes the sauce in these Pintos creamy and luscious. I absolutely presoak (see Brining Beans Traditional or Instant Pot Methods) my Pinto Beans, whether I’m making them on the stovetop because it saves time (it knocks about 30 to 45 minutes off the time) or in the Instant Pot (it knocks off about 30 minutes and the Pintos don’t come out a mix of soft and crunchy. I HATE that!) And while I mostly I presoak because the beans just cook more evenly, presoaking makes them more digestible. You know what I mean by digestible, lol! I don’t have to spell it out or recite the song like my 87-year-old Pops did everytime we have beans? (We both have one thing in common – we’re children at heart!) Presoaking also makes some of the nutrients more accessible – and as long as I’m preaching, check out what the World’s Healthiest Foods has to say about Pintos. If you have Epazote, add a sprig or two to your beans. I’m really psyched because I planted some in my herb garden this year! I’ve never been able to find it at a market Up Nord here in Minnesota. As far as the Mexican Pinto Bean Spice, add however much you think you should. I’d start with at least a tablespoon for some mild flavor, but probably two or three would be best. It’s not seriously spicy. Then when the beans are finished, give them a taste. Add a little more of the Mexican Pinto Bean Spice if you’d like, just simmer the beans for three or four minutes after to lose that raw spice flavor that can be so up front and in your face when you’re dealing with dried chiles. You do want these beans highly flavored, and depending on how much of the spice mix you use, you might or might not want to add a little salt or hot sauce to your beans. I haven’t added any salt to my Mexican Pinto Bean Spice since it has chicken buillion, which is salty already, so if you haven’t used much of it you may want more salt. Let’s face it – canned beans are not a huge budget breaker, but homemade Pintos beat them out in flavor and price! I love to buy my Pintos at Aldi and I believe that the last time I took notice of the price there it was for a three pound package for $2.49. If you’re curious, that makes the beans about 83 cents a pound. A pound of pintos is usually about 5 1/2 to 6 cups cooked, so the cost of my beans (not counting spices, etc.) counting on 6 cups is about 15 cents a cup. Since a can of pinto beans is usually about 1 1/2 cups worth, the price of the dried beans at 1 1/2 cups for comparison is about 23 cents. I honestly don’t know what the price of a can of pintos is, probably around 80 cents to a buck these days? so there are some savings. You might want to use those savings to splurge on some Queso Fresco or make a homemade version. It’s super simple to make and so delicious although a bit of a process. It’s a great way to get kids involved in the kitchen, especially if they love that stringy mozz cheese because the Queso is super mild and has such a great flavor. If you aren’t serving these as a side or serving already with tortillas, check out one of my cornbread recipes. There’s nothing like a mess of pintos with homemade cornbread! The Southern Skillet Cornbread isn’t my fave for just “eating” but can’t be beaten, with its drier texture, for breaking up in the saucy Spicy Pinto Beans Instant Pot or Stovetop. Anytime I make pinto beans, even if it’s just for myself, I make a whole pound and freeze any extra in 1 1/2 cup portions. Then they’re at the ready if I want to make a little chili or a burrito or bowl or just use them as a side. Add all ingredients to Instant Pot or heavy-bottomed Dutch oven. For the Instant Pot, seal and set to High Pressure 25 minutes. Let go to Keep Warm for 10 minutes, then do a slow manual release. A slow manual release is releasing the pressure a bit at a time, then letting the pot rest for a bit then release a little more and so on. If you hear a lot of sputtering or anything other than steam comes out of the spout, stop and let the pot sit for about five minutes, then proceed. Taste and adjust seasonings to your liking. For the Stovetop Version, add all ingredients to the Dutch oven. Bring to a boil, turn to a low simmer, partially cover and cook 1 1/2 to 2 hours until tender, adding more water as needed to keep the level about an inch above the beans. Stir every now and then and more often towards the end. Taste and adjust seasonings to your liking. Test several beans for doneness. If adding more of the Mexican Pinto Bean Spice, simmer for three to four minutes after the addition. I’ll be posting Spicy Pinto Beans Instant Pot or Stovetop and co-hosting at Fiesta Friday Blog Party #238 with Mikaela @ Iris and Honey. If you have a minute, do stop by and check out Fiesta Friday and Mikaela’s very lovely site! I know you’ll love them both!! 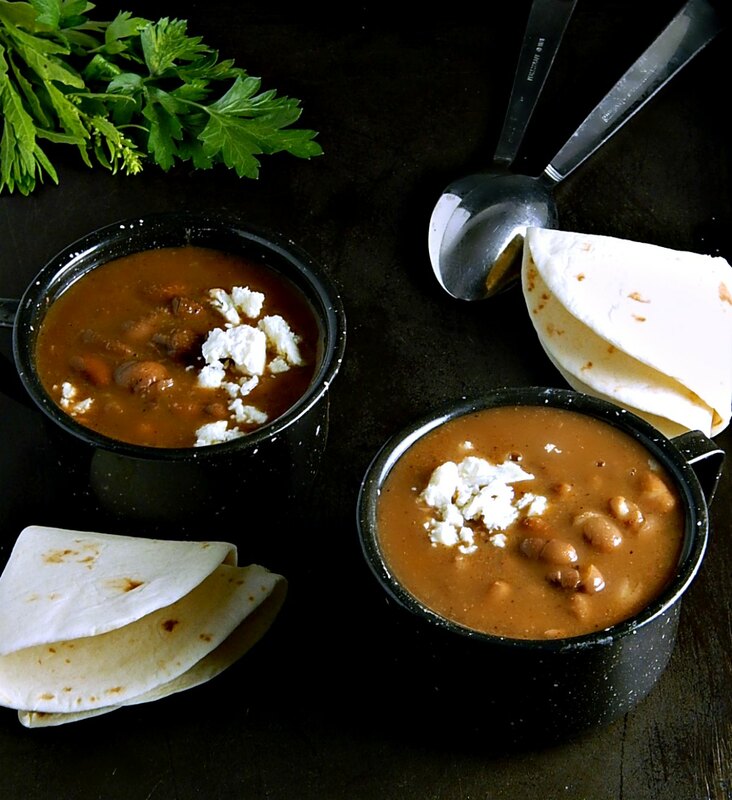 This entry was posted in Click here for Bargain Meals, Click here for Fabulous Food Posts and tagged Dried Beans, hearty sides, Instant Pot, Mexican or Southwestern, Mexican Pinto Bean Spice, pinto beans, Side. Bookmark the permalink. Me, too! And they are so good for you! These look delicious, Mollie! I love comforting and spicy food like this. Thank you for sharing a spicier version, even if it’s not your thing. 😀 I hope you have had a nice summer. I have been away most of the summer. Oh, I hope you’ve been having fun!! Summer is almost over and I don’t think I’ve had enough fun!! I have to get it in gear!! Your Pops sounds like fun. This looks like a proper stick to your ribs meals. Very nice. I do love pintos as a meal or as a side – I guess because I lived for a lot of years in the Southwest. Yeah, my Dad is a hoot…he can make even the most mundane things fun! This sounds like a great soup! I’ll have to keep this in mind for fall! Yes it’s nice and hearty! Just in time! I have been asked to bring beans to a party this coming Saturday. I will get out my instant pot, which I haven’t really used since making winter soups. But still you’re using it! Have you guys gotten all settled in and comfy, now? We are settled but I am waiting for a little more quiet routine. We have been traveling most of the summer, now in Italy for 3 weeks. Taking full advantage of retirement. I am starting to look forward to fall and winter when I will get back to my kitchen and blog. Wonderful! I can’t wait to hear more when you get back, Liz!! I’ve never even heard of pinto bean spice! sounds delish – will be trying asap! Chipotle Mexican Grill was one of my favorite lunch stops when we lived in the US. So, I’m very anxious to give you IP recipe a try. Some say you don’t need to pre-soak beans when pressure cooking. I’ve tried both ways and I now always pre-soak my beans. I like Chipotle’s, too, but these aren’t really a copycat. And I’m glad to hear you agree about the presoaked. I wanted NOT to have to presoak but I’ve tried several methods w/o presoaking and they all end up with crunchy beans. I must have been visiting your site just about the time you stopped by here! I just love your Chloe! She looks so sweet! Wow I didn’t realize I had so many Chipotle recipes on here!